Before the hand-held Stucco Sprayer, concrete contractors who wanted to work vertically had to settle for one of two extremes – a large, costly pump, requiring a crew of four to six, or hand-stacking. The Sprayer fills a niche between the two, giving contractors a right-sized option for shotcreting small to medium-sized jobs. Currently produced in the United States by Mortarsprayer.com founder Nolan Scheid, the sprayer is a bucket-sized hopper perforated with multiple holes 3/4 inch in diameter. 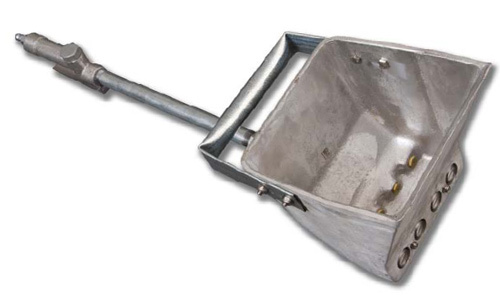 The user simply connects the hopper to an air hose and compressor, scoops the shotcrete mix into the hopper and starts to spray through the holes. The Stucco Sprayer is supplied with two sets of jets. The smaller set requires an air compressor that delivers at least 7 cubic feet per minute (cfm) at 90 psi. The larger jets use a minimum of 12 cfm at 90 psi but can be run off a much larger compressor if that is what is available on-site. More air can help throw the mix harder onto a wall. Multiple sprayers can be connected to the same compressor. Because the Stucco Sprayer is filled by scooping the mix from a wheelbarrow, there are no hoses to clog, eliminating a common source of irritation for shotcreters. If a piece of aggregate lodges in a hole in the hopper, it can be easily removed by hand. The sprayer can be used with aggregates up to 5/16 inch. Scheid recommends using a mix "thick enough to stay in the hopper when scooped, but thin enough to spray through the jets easily when the compressed air is turned on." A trial spray should be used to determine optimum water content. Toledo, Ore., contractor Michael Dahl describes the Stucco Sprayer as a "mini-shotcrete pump without the delivery lines." He uses it as an extra tool on large jobs to back up line-pump operation. It works great if you have fallouts, he says, or voids that the line pump missed. He uses it to blow shotcrete up instead of throwing it up by hand when he needs to patch or feather a spot after the ready-mix truck has moved on. It is also useful for small areas where it would be difficult to run a mixer and hoses. For contractors working on large, high-volume installations, the Stucco Sprayer is a useful accessory or tool for augmenting a pump system. On smaller-scale projects, it may eliminate the need for the pump. Decorative concrete contractors might find the sprayer useful for vertical stamped concrete, artistic wall finishes, stucco and GFRC. The hand-held Sprayer reduces labor costs associated with both hand-stacking and pumping. On smaller jobs it mechanizes a highly labor-intensive, time-consuming process. For larger jobs it reduces the crew size required to shoot concrete and offers the flexibility to set the work pace and start and stop work as required. The Sprayer can also be used with other building techniques, such as straw-bale, earth-bag, insulated-panel and thin-shell or ferrocement construction. Stan Petersen, a mason in Tremonton, Utah, first used it to apply plaster to a straw-bale house. He claims he can empty a wheelbarrow full of plaster in four or five minutes, double or triple the speed of troweling the material by hand. Now he owns several Stucco Sprayers and uses them on projects around the country to spray clay, lime and gypsum plasters as well as cement-based stucco. They are much easier to transport than a full-size pump system, and at a cost of just a few hundred dollars each (excluding the compressor, which is sold separately), he can afford to keep several on hand. The Mortarsprayer.com sprayer is similar to the Tirolessa sprayer, a tool manufactured by a Mexican company that Scheid distributed for about a decade before making his own. "We have improved quality and made several improvements, the most noticeable being the extra handle and changeable jets." With the Stucco Sprayer from Mortarsprayer.com, contractors have an option for spraying concrete that falls between the extremes of hand application and large-scale pumping. That is a nice niche to be in.